It’s no accident that this villa’s name is red. 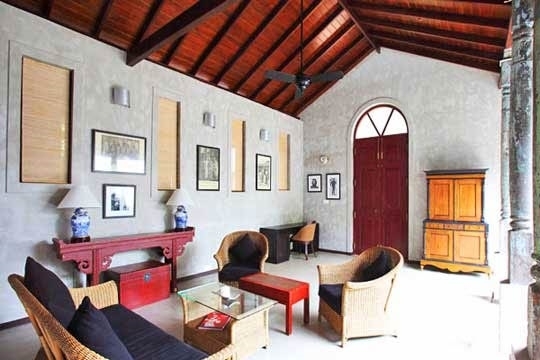 It’s the colour of passionate revolutionaries and the owner of Villa Red, an innovative figure in Sri Lanka’s apparel and sporting industries, has embellished this theme throughout the villa by displaying iconic images of some of the twentieth century’s most famed cultural visionaries. 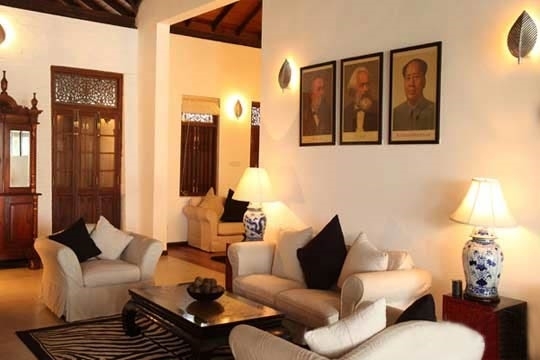 Paintings, prints and photographs of such controversial leaders as Mao Zedong and Che Guevara pump personality into the villa as they gaze down into the house and prompt topics for after-dinner conversations. The owner is also a keen boxer and his sporting idols – such as Mohammad Ali - also scatter the walls; the master suite, particularly, is a treasure-trove of recent sporting greats. 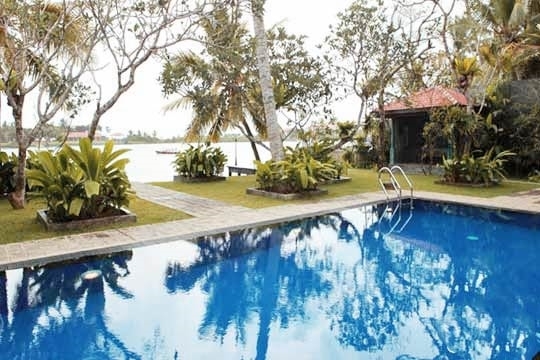 Beneath this iconography sits an elegant five-bedroom villa that borders the Bentota River, a stone’s throw from a four-kilometre stretch of beach. Prettily set in a manicured tropical garden enhanced by a swimming pool languishing beside swaying palms and exotic red blooms, the villa exhibits a contemporary open-plan design that feels particularly convivial; the long dining table extends almost into the garden itself. Red is an ideal villa for a large or multi-generational family, since there’s one huge master bedroom and four smaller doubles. 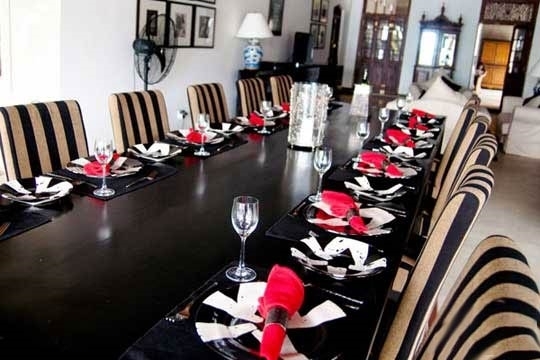 The villa comes with a staff team of three, including a cook, and there’s a great kitchen, although the cook’s creations (western and Sri Lankan cuisine) are more than enough to deter guests from taking over the stove . Oriental furnishings liberally scatter the villa alongside a collection of more conservative Sri Lankan wardrobes and dressers. Cupboards stocked with DVDs, tables topped with glossy tomes and a full CD collection provide diversion from the water-borne activities for which the region is famed. 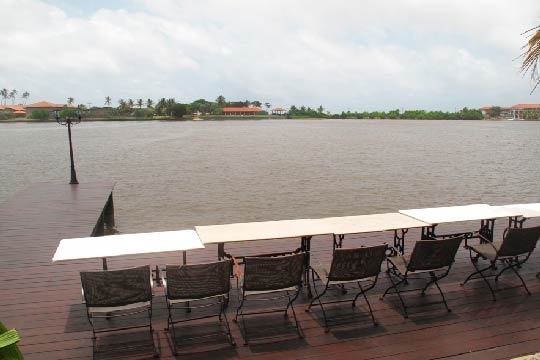 Bentota offers many fun activities for families and sports enthusiasts both on land and water. Waterskiing, windsurfing, jetskiing, fishing and even banana-boating can all be directly embarked upon from the villa’s private jetty that lies to the front of the garden, whilst the beach is only a five minute drive away. For the water shy, there are many opportunities to visit fish markets and local temples, and take scenic bicycle rides inland. 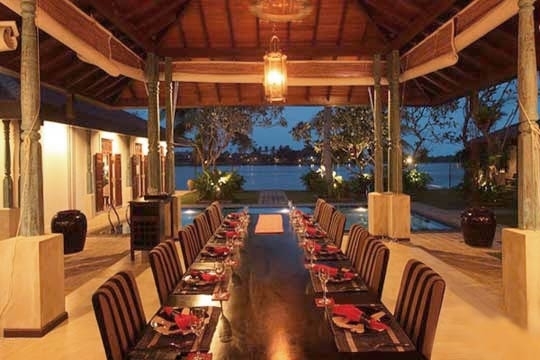 The villa’s excellent central location in Bentota means that there are many good restaurants, shops and spas within easy reach. Villa Republic bursts with character and is definitely one-of-a-kind. Apart from its more obvious links with social revolution, the colour red makes its presence felt in many other exotic forms here; the heliconia flowers that droop heavily onto the lawn, the windsurfing boards criss-crossing the river and the great big ball of fiery sun that descends right in front of the villa every evening. This is a magical place to stay, not only because the villa is homely and convivial but also because there’s so much right on its doorstep; water sports, beaches, river exploration, inland cycling, spas, restaurants, and the list goes on. The master suite is a lot more spacious than the other four bedrooms, which means a toss of a coin if staying with friends, but heaven for parents with a gaggle of kids in tow. 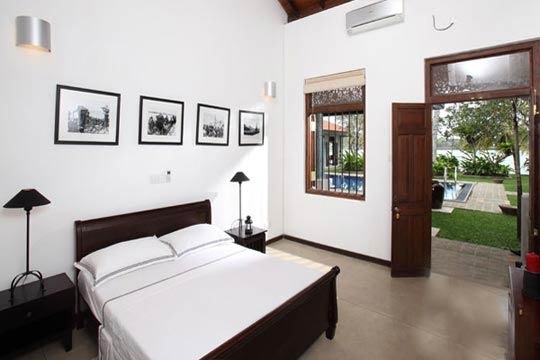 For a five-bedroom property, Villa Republic Bentota is very good value. All food is charged at cost price and we enjoyed delicious local curries and pasta dishes during our stay. Mr Fernando heads up the staff team of three (plus security guards) and although he strived to make sure we were always well-fed and watered, we liked that he left us to our own devices too. We weren’t massively keen on the fixed glass panels in the master suite that covered two of the side doorways, as it would have been nice to have the breeze flowing freely from the garden. That said, the glass panelling at the front was wonderful for maximising views of the river right from the bed (with AC on high! ): by day we watched water skiers, jet skiers and wind surfers, and in the early morning before anyone was around, we watched fishermen embarking upriver. Note that the villa’s garden isn’t large, so although you’ve got loads to do on your doorstep, space might be limiting for energetic young kids. We loved Villa Republic's personality. Visually and emotionally it packed a punch, and its situation beside the river is stunning; make sure you have at least one candlelit dinner on the jetty while you’re here! Its location is fab for water sportsmen and beach bums alike, with a jetty out front and the ocean only five minutes’ away. 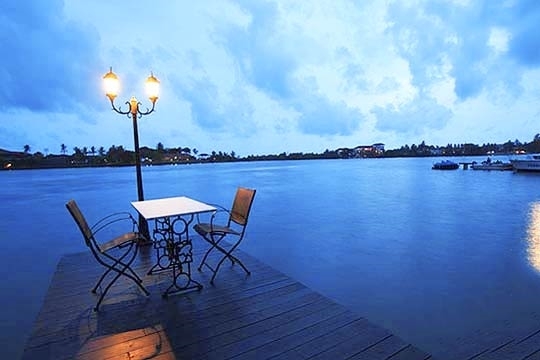 For those looking for a choice of eateries and spas, Bentota is also the place to be. If you’re looking for complete peace and privacy, then this villa’s location does have its flaws as the tranquillity is often broken by jet skies and boats (some of them quite fumy), plus the regular 8am seaplane departure. Although the timber decking and jetty is to the far side of the garden, there is no boundary fence or wall so parents will need to keep an eye on wandering toddlers. 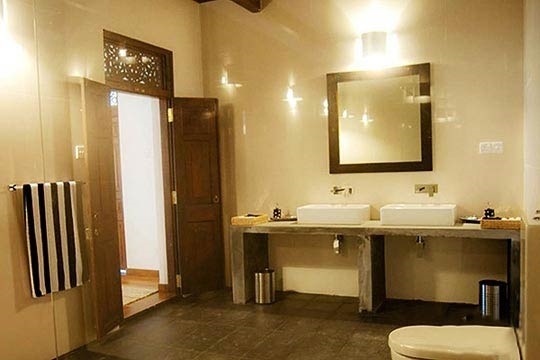 We thought the bathrooms could have done with some brighter lighting. 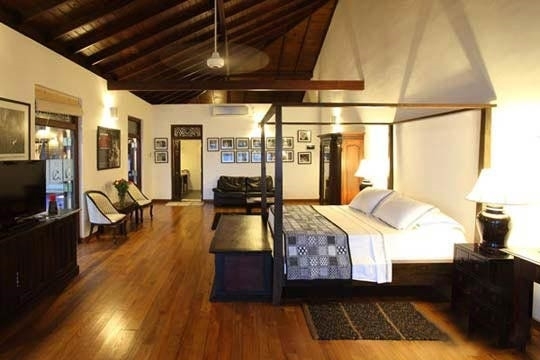 Villa Republic is situated in Aluthgama, beside the Bentota River, just to the north of Bentota. Sweeping views of the river can be enjoyed from the villa’s garden and there are a couple of reputable water sports outfits just next-door. The narrow road that the villa sits on leads to guesthouses and restaurants flanking the river, plus a particularly good wood carving shop where you can see some of the island’s most famous designs being created – all by hand, of course. Walk up to the main road (10m) and turn left and you’re in Aluthgama, which has a range of tourist shops, supermarkets and banks. The long stretch of beach at Bentota is just a five-minute drive or, if you can arrange it, an even shorter boat ride away. The Sri Lankan Air Taxi (sea plane) lands on the river opposite the villa, so if you’re coming straight from the airport you can dismiss the road and arrive here in style, in no time at all. The elegant living and dining spaces of this sociable villa link smoothly from one to another: the front entrance opens into a spacious foyer with comfy wicker chairs laid out under the watchful eyes of Che Guevara, and from here doors lead into an L-shaped living room furnished with plush white sofas and a dining table for ten which stretches lengthily between slender timber pillars towards the garden and pool. In the living room, Mao Zedong’s portrait rises tall above a flat-screen TV whilst ceiling fans gently whirr overhead. Also on the walls are mounted photographs of John Lennon gazing peacefully towards a glass-fronted cabinet stocked with Communist books, Russian fur hats, medals and photographic accounts of the Vietnam War. DVDs stock another cabinet topped by a sound system attached to a CD/DVD player. Secreted to one end of the living room is a nook furnished with matching white squashy sofas and book-topped coffee table, designed for quietly stealing away. Leading off from the living room is a spacious fully equipped kitchen. 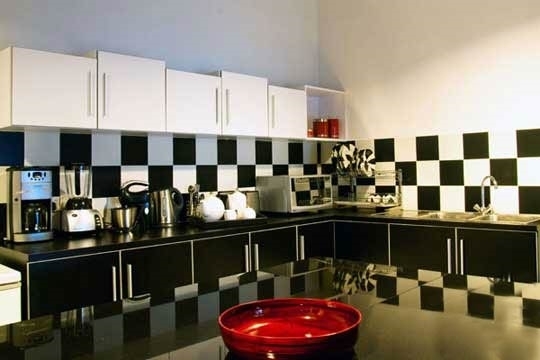 Worktops are finished in smart black terrazzo, and its monochrome décor harks evocatively back to the 1940s. The five bedrooms all open onto the garden terrace and swimming pool. Of these, four are located in pairs either side of the dining area. 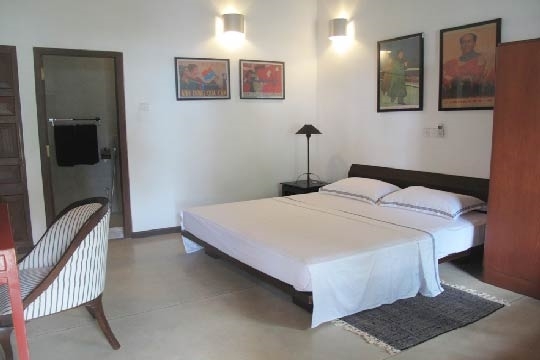 These rooms are almost identical, and come with double beds (two queen size and two standard), side tables, built-in cupboards and ensuite bathrooms with showers. All that sets them apart is their thematic artwork, which includes Vietnamese propaganda posters, framed photos of Soviet freedom fighters and American boxers. The very spacious master suite faces the river, with tall glass panels to the front making the most of the aquatic views. A four-poster bed, wardrobe, dressing table, chest with a flat-screen TV and DVD player top the warm timber floors along with a black leather sofa for lounging. Photographs of the owner at prestigious sporting events, adorn the walls. Attached is a big ensuite bathroom with twin sinks and a shower. Within the garden is a small pavilion with bench seating for hiding away and gazing over the pool. Beyond, a long wooden deck topped with tables and chairs is perfectly sited for watching activity on the river and the sun setting westwards at dusk. 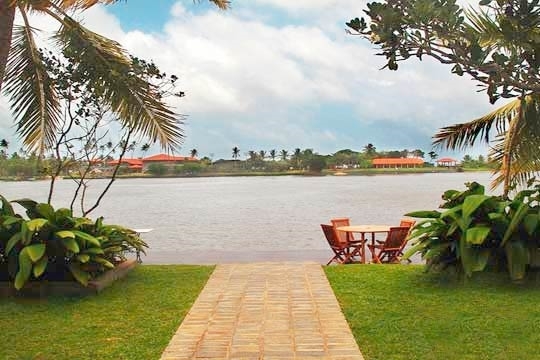 5 bedroom villa located in Bentota, West Coast. Ideal for Beach in ten, Bring the relatives, Kid friendly, Room with a view, Walk into town.